Music Tech have reached out to their user base with this apology and dedicated FAQ page to help frustrated users. They say…. As you’ve probably heard, the new AIR Instrument Expansion Pack is now available for purchase, and we’ve seen an overwhelming demand for these new instruments. Unfortunately, due to that demand, our hosting partner, Digital River, has been challenged to provide the level of service that we, and you, would expect. 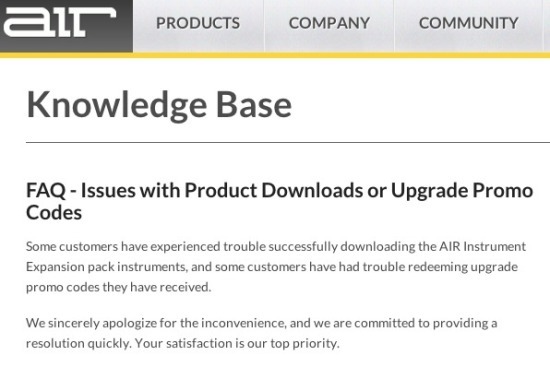 As a result, some customers have experienced difficulties downloading the instruments successfully, and some customers are having issues redeeming upgrade codes for the AIR Instrument Expansion Pack. If you’ve had either of these problems, we sincerely apologize for the confusion and, frankly, for the frustrating experience you’ve had. We’re committed to fixing this as quickly as possible, and your satisfaction is our priority. We’re working diligently to make all of this right and to provide you with what we initially promised—world class virtual instruments at an affordable price. To get you the answers you need as quickly as possible, we’ve set up an FAQ page. There you’ll find the best information on how to solve any issues you may have encountered with purchasing the AIR Instrument Expansion Pack. Thank you for your business. We appreciate your patience and hope to empower you with these innovative instruments as soon as we can. For help visit our FAQ page. We are sorry but we cannot help individuals with problems, some of us are suffering too. But we do continue to feedback all your concerns to the AIR team and will continue to serve you the best way we can by bringing updates and information as soon as we have it.